A digital book (aka ebook/e-book, electronic book) is an electronic version of a full-length publication consisting of text, images, or both, which can be downloaded to a handheld reading device, personal computer, tablet, or even a phone. 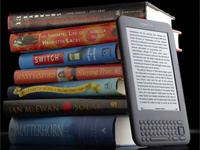 The Merriem-Webster Dictionary defines the ebook as "a book composed in or converted to digital format for display on a computer screen or handheld device," but ebooks can and do exist without any printed equivalent. The Merriem-Webster Dictionary defines digital publishing as "publishing in which information is distributed by means of a computer network or is produced in a format for use with a computer." Simply put, publishing to an electronic format rather than to print on paper. What is the advantage of digital books?  For those with allergies, it means no more physical books collecting dust, which attract paper eating house pests which can trigger alleries. 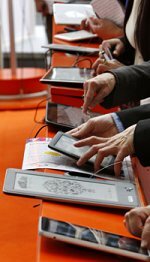 Are there disadvantages to digital books?  What to do with old or obsolete devices when you trade up?  And probably a very important disadvantage, the FAA -- the USA's Federal Aviation Administration -- restricts the use of all electronic device on commercial airliners during takeoff and landing. This has been the standard for years with the likes of CD players and computers, but tablets, phones, and ereaders have been included in this restriction. How are digital books purchased? Each digital bookseller has their own policy, but generally, digital books can be purchased by using a standard credit card, through PayPal, or though proprietary gift cards and vouchers which are applied to the reader's account prior to purchasing books. Where can I learn more about Tirgearr Publishing digital books? Check out our F.A.Q. page. If you have a question about digital books that hasn't been answered here, please send us an email.